My friend told me about some bear named BOZ…who is he? What makes BOZ different from other preschool programs? Will I be able to see BOZ on TV? Can I tell you what I think about BOZ? Why is BOZ’s name always in capital letters? Q:My friend told me about some bear named BOZ…who is he? BOZ is a green bear that loves exploring God’s world and discovering exciting new things with his friends Drew and Gracie, their family, and all their neighborhood friends. 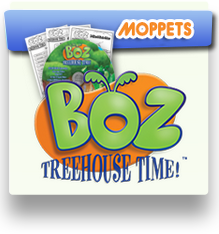 BOZ is also a new preschool program that is now available on DVD (and in books). You can find more About BOZ here. Q:What makes BOZ different from other preschool programs? There are many aspects of the program that help make BOZ the special green bear that he is! BOZ is a lot of fun. He helps kids learn and discover God’s world in a wonderful environment. And he and his friends hold parents in high esteem. That’s because the people who created BOZ are committed to developing entertaining stories that help reinforce key educational concepts and foundational faith values that you’re teaching your preschool children. Q:Will I be able to see BOZ on TV? BOZ is available exclusively on DVD. You can purchase BOZ DVDs and books at your favorite Christian retail stores. You can also purchase them online here at Store.BozTheBear.com. Exclaim Entertainment, LLC, a family-entertainment company grounded in Christian values. Company founders Dennis DeShazer (a co-creator of Barney) and Jon Green are the co-creators of BOZ. Find out more here. Q:Can I tell you what I think about BOZ? By all means … we love to hear viewers’ feedback. Just contact us here. Q:Why is BOZ’s name always in capital letters? That’s just how this green bear spells his name!